This song was written in an unusual way, even for us. I threw together some drum loops and a bassline. Then Leslie and I started singing the coro (Eh eh, La Habana) over the loops and it felt great. We wanted to develop some verses with a nostalgic remembrance of Havana from years ago. We asked Roly (Leslie’s cousin) to help to write the verses. He crafted some beautiful and poetic lyrics that we loved. Leslie and I adapted them to our melody. 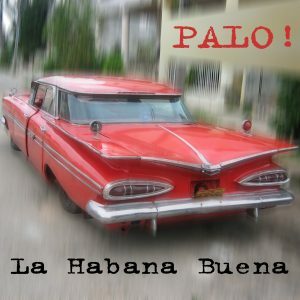 As with many of our early songs, “La Habana Buena” began with a only a basic form. It developed more as we performed it live, and began to take more shape. The vocal mambo section just happened spontaneously one night. As the song built tension, it just sort of exploded. It’s fun singing that part! I love how Leslie delivers the vocal on this song. It has an amazing energy and build. Raymer’s incredible timbale solo gives you a quick sample of his mastery. And Ed’s sax playing is awe-inspiring. For the recording, we were lucky to be able to bring in the great Jose Elias to give the Tres (Cuban guitar) loop just the right feel. When we perform this song live, it often takes some unexpected twists and turns. Usually, the audience sings along with us and really gets into it. We hope to release a live recording of the song in the future. The video of this song, directed by Rubén Abruña, was premiered on May 20, 2010, Cuban Independence Day, at De Rodriguez Cuba.